Picture it: It's a lazy, hungover Sunday afternoon. You're lounging around in your indoor saltwater Jacuzzi or, more realistically, on your friend Steve's super-uncomfortable couch, nursing a freshly cracked can of LaCroix, when a brilliant idea pops into your aching head. "Hey," you marvel, brushing nachos off your undershirt in an attempt to sit up straight. "This is great, but how much better would it be with alcohol?!?" Well, bud, you're not alone. 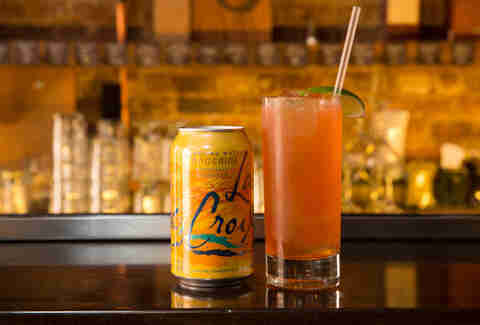 LaCroix cocktails -- LaCroixtails, if you will -- are a definite thing, so much so that we got NYC-based bartender Maggie Eckl -- who slings her drinks at none other than the Spirited Awards' Best Bar in the World, Dead Rabbit Grocery & Grog and the phenomenal new Black Tail -- to put together these 11 original recipes in your honor. So pick up a few sixers (of sparkling water, that is), stock up on home bar essentials, and saddle on up -- we're in for a bubbly ride. This potent, tangy cocktail can be served with or without ice. I like to use Olmeca Altos, a smooth tequila blanco (i.e., clear in color and assertive in flavor), for its citrus notes and agave aroma, but feel free to go with any blanco tequila of your choosing. Combine grapefruit juice, vermouth, and tequila in a tall glass over ice. Add Tangerine LaCroix to fill. Pop in a straw and enjoy. 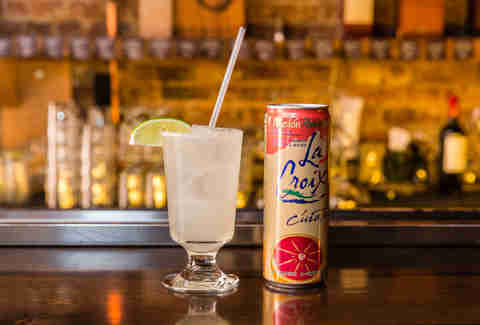 Everyone loves a gin and tonic, and Lime LaCroix just amps up the typical juice. It doesn't matter what kind of day you've had, they're always there to refresh and restore you. For my home bar, I always keep a bottle of Tomr's Tonic, a concentrated tonic, in my fridge, but you can also use the regular stuff. In terms of type of gin, it's all up to you: American gins like Aviation showcase lavender and sarsaparilla flavors, while traditional London dry styles like Plymouth are more juniper-forward. Fill a tall glass with ice and add gin. 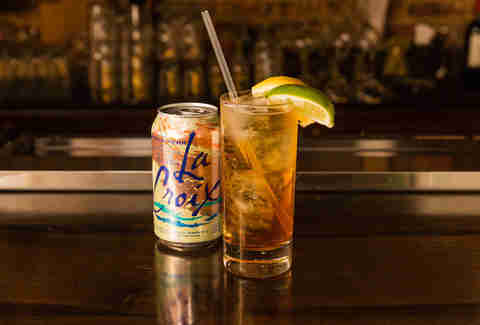 In a separate glass, combine Tomr's Tonic or bottled tonic water and LaCroix and stir carefully. Pour tonic mixture over the gin and stir. Garnish with a lime wedge and serve. This cocktail is a dealer's choice in terms of base spirit. I'd go with a gin like Dorothy Parker or Jensen's Old Tom for something a little stronger. And for a less boozy cocktail, I'd choose a fino or manzanilla sherry. Have fun with this one! A professional bar would use crushed ice for this style of cocktail, but you can make some at home and have a bit of fun, too. Add a few ice cubes to a sturdy Ziploc bag. Cover the bag with a towel and using a mallet (or any large, heavy utensil like a rolling pin or heavy ladle) crush ice (also helps with post-work tension!). 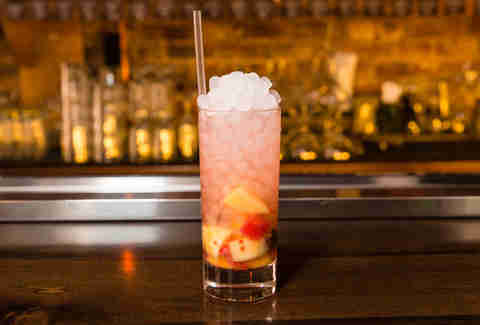 Muddle the fruit delicately in a heavy-bottomed pint glass, just enough to release their own juices. Add liquor to the glass and stir to combine. Fill pint glass with the ice, top with Berry LaCroix, and garnish with a sprig of mint, if using. This is a super-simple tangier, sweeter version of the popular Moscow mule. 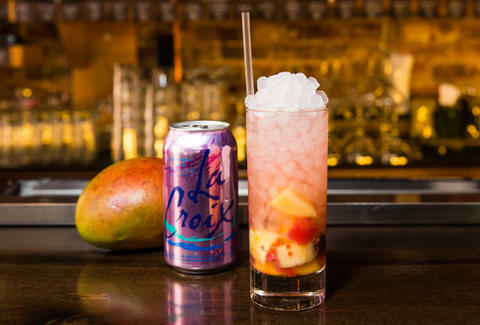 The LaCroix and cognac soften the ginger beer's bite for a fruitier twist. Cognac will carry through with orchard fruit notes and make for a lovely fall-forward sipper. Fill a Collins glass or traditional Moscow mule mug with ice and add all ingredients. Stir briskly to mix and top with lemon and lime slices. This easy, faintly fruity red wine spritzer is a lighter, fun alternative to a sweeter sangria. Fill a standard white wine glass with ice. Add red wine and top with LaCroix. Stir gently and garnish with berries. 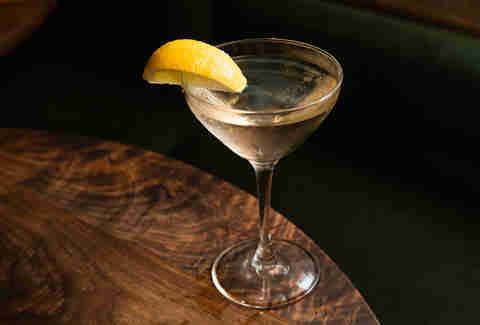 The Vesper, a martini variation made popular by James Bond, is back, baby. 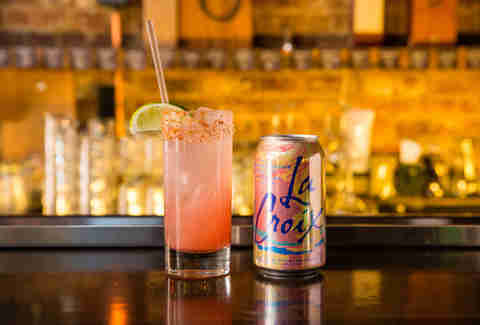 The LaCroix-spiked version combines elegant, botanical-forward gin with orange bitters and the crisp, herbaceous Italian aperitif Cocchi Americano, then livens things up with Lemon LaCroix and sparkling rosé. Again, here your gin choice is important. I would go with Botanist for its heartier body and juniper-forward bouquet. Fill a mixing glass with ice, add gin, Cocchi Americano, and bitters, and stir until frosty. Strain into a chilled coupe or martini glass, fill with LaCroix, and finish with a splash of sparkling rosé and a lemon wedge garnish. A good Aperol Spritz can be the smoothest way to kick off a big meal as well as a breath of fresh air after a long night out. The LaCroix works in concert with the prosecco to balance out the aperitif's syrupy, bitter notes, while the grapefruit peel sets off the drink's bright aroma. Pour prosecco and Aperol into a large wine glass filled with ice. Top with LaCroix, stir well, and garnish with the grapefruit peel. This Paloma recipe is kicked up a notch with the addition of smoky mezcal and fiery chili powder, while the fragrant sparkling water cuts through the juice's bold acidity to soften the blow. Drink this with brunch -- or even breakfast, no judgment -- or on an autumn afternoon spent soaking up what's left of the sun. I would use Ilegal mezcal for its agave notes and delicate smoke. Whisk the sea salt and chili powder in a shallow bowl until well mixed. Run a grapefruit wedge around the lip of a tall glass, tip it over into the spice mixture, and press evenly to coat the rim. Fill the glass with ice and set aside. Combine mezcal and juice in an ice-filled shaker, shake hard, and strain into the rimmed glass. Fill with LaCroix and top with a grapefruit twist. 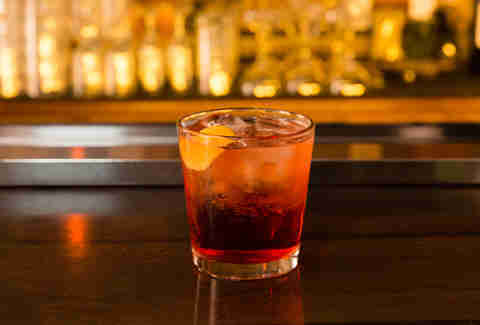 This is a jazzed-up twist on the traditional Negroni, a stiff, bitter sipper that's seen quite a resurgence over the past few years. Here, equal parts sweet vermouth, Campari, and gin -- or mezcal if you prefer a richer, earthier experience -- mingle with floral, citrusy Orange LaCroix to make the smoothest, easiest-drinking old-man cocktail you've ever seen. Add sweet vermouth, Campari, and gin or mezcal to a rocks glass filled with ice. Stir briskly and top with LaCroix. Garnish with an orange twist. A refreshing take on the classic Hemingway daiquiri. The addition of bubbly Pamplemousse LaCroix really makes the fresh citrus flavors pop. Get playful with your white rums. Bacardi Neo, Plantation 3 Stars, and Cana Brava are all rums I keep at home. Add rum, grapefruit juice, and lime juice into a mixing glass filled with ice. Stir gently. Pour into a Champagne flute, top with LaCroix, and garnish with a lime wedge, if using. A friend to lovers of rum, cognac, and tequila alike, pisco is an unaged, brandy-like spirit with a very unique flavor profile and lovely light body -- kind of like how LaCroix is a beautifully sophisticated version of regular old seltzer. Mixed with lime, simple syrup, and a flowery blend of Passion Fruit and Pamplemousse, this aromatic cocktail is both classy and refreshing. Fill a cocktail shaker with ice, add pisco, lime juice, and simple syrup, and shake. Strain into a Collins glass over ice and top with LaCroix. Meredith Heil is a staff writer for Thrillist. She was born underwater with $3 and a LaCroixtail, tryna make the Garden of Eden out of Peach Pear and ginger ale. More @mereditto.